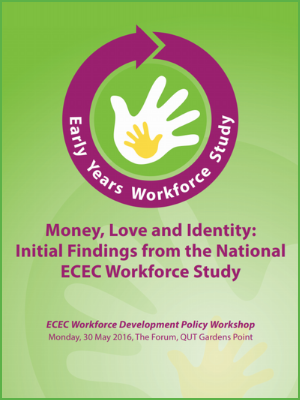 Money, love and identity: Initial findings from the National ECEC Workforce Study shares the initial findings of a National Early Childhood Education and Care Workforce study – a three-year national study funded by the Australian Research Council. In addition to findings from the study, this report shares key takeaways from conversations during a workshop hosted by the researchers. Capturing responses from participants of this 76-delegate workshop, here you can find observations and insights into emerging themes and the implications they have for policy and practice. 4. Key themes responding to the question – looking forward, in an ideal world, what is one ‘must have’ in a national ECEC Workforce Strategy?